When the Pritzker Family Children's Zoo was created in July 2005, it included a large, wooded yard that Lincoln Park Zoo staff hoped would one day house a thriving wolf pack. 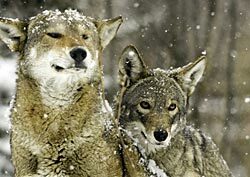 In April 2007, those hopes were realized with the birth of five red wolf pups. In April 2009, a litter of six pups was born. Four of these pups were transferred to North Carolina as part of the Red Wolf Recovery Program, where they were introduced to existing wolf packs for cross-fostering. Two pups remained in Chicago. 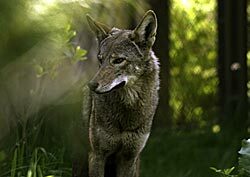 While the red wolves excite and educate guests at Lincoln Park Zoo, they are also helping to repopulate the wild and enabling zoo scientists to better understand this fascinating—yet fragile—population.